Macy's offers the DKNY Women's Mer Peep-Toe Espadrille Sandals in several colors (Beige pictured) for $77 with free shipping. That's $33 off and the best price we could find. They're available in sizes 5 to 11. Today only, Good Guys Electronics via Rakuten offers the 3rd-generation Nest Learning Thermostat in White for $202.99. Coupon code "GG32" cuts it to $170.99. With free shipping, that's $2 under our mention from three weeks ago and the lowest price we could find by $36. It "learns" how to set your home's temperature, downloads data, and can be controlled from your smartphone via WiFi. Additional contributions by Louis Ramirez and Michael Bonebright. HDTVs are the highlight of most Black Friday sales, often causing deal-giddy shoppers to wake up at the crack of dawn for a chance to purchase one on the cheap. But this year, you can say goodbye to waiting in line for a Black Friday TV deal; they'll be available at price lows no matter where you shop. And with analysts predicting a resurgence in big-screen TV sales, this Black Friday is poised to be one of the best weeks for making the jump to a 55"+ HDTV. There's no doubt that 42" HDTVs stole the show during Black Friday 2012; with prices as low as $179, retailers were practically giving them away. The chances of seeing better prices this holiday season are very slim, so retailers have now moved on to slashing big-screen TV prices, namely 55" sets, in hopes of getting consumers to upgrade. This year we predict that 55" 1080p LCD HDTVs will hit a record low of $429, which is 28% lower than the best price we saw last Black Friday. But for a better value, consider a 55" 3D LCD HDTV, as such models will be priced just a few bucks lower. 3D technology officially went mainstream this year; no longer a high-priced feature on premium TVs, 3D tech became a standard offering along with built-in WiFi and faster refresh rates. As a result, this summer we saw an influx of price lows on 2012 3D sets. 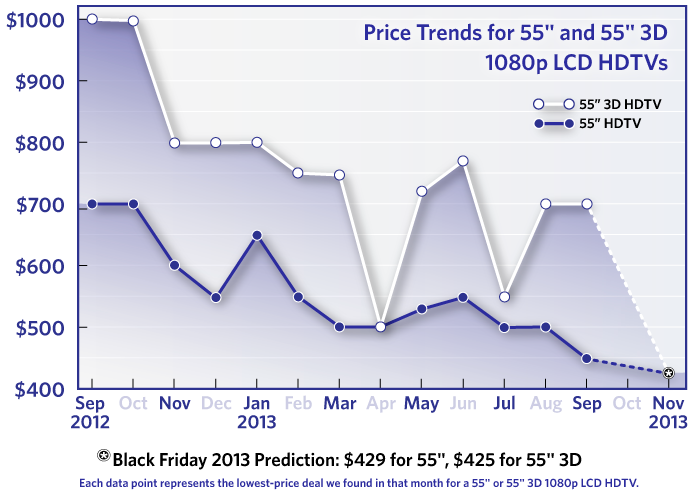 55" 3D TVs, in particular, saw the biggest price drops, as you can see in the chart below. Because of these price drops, we predict that this category will offer the biggest bang for your buck come Black Friday. And with the majority of these sets coming from name-brand manufacturers like Samsung and LG, this category should offer some of the most exciting deals. That said, we're predicting 55" 3D 1080p LCD HDTVs will hit $425 this Black Friday, which makes them just a few bucks cheaper than their non-3D counterparts mentioned above. 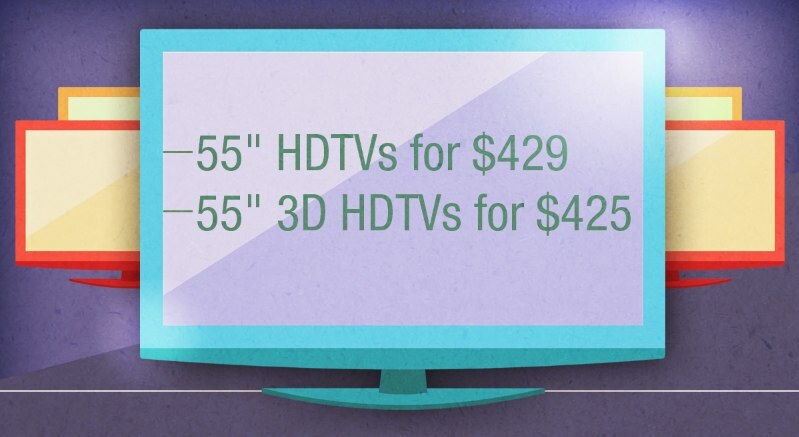 Twice this year, we saw deals on 55" 3D and 55" non-3D LCD HDTVs that have either tied or come within $50 of each other, so it's not that big of a stretch to predict 3D TVs will cost about the same (or less) in November. If added features and brand names are important to you, then 55" 3D Black Friday TVs will be tough to beat. 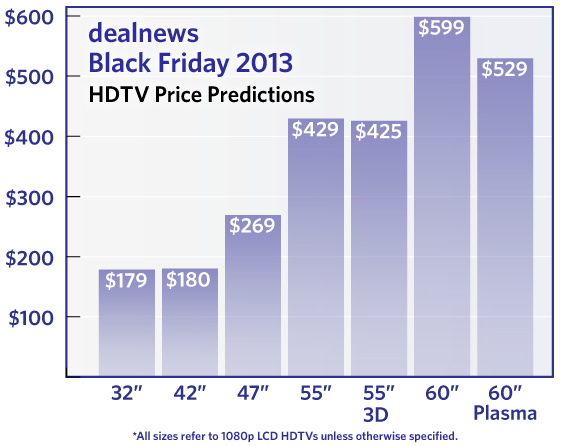 Like their 55" counterparts, 60" 1080p HDTVs will also see significant price drops on Black Friday. However, for the most savings, we recommend consumers opt for plasma over LCD as the former will be slightly cheaper at our predicted price of $529. By comparison, we're expecting similarly-sized LCDs to cost $599. If the extra savings aren't enough to win you over, also keep in mind that the majority of 60" plasma deals we see are from name-brand companies, whereas most 60" rock-bottom LCD deals come from third-tier manufacturers like Element and Dynex. On average, plasma TVs in this size category have been roughly 6% cheaper than their LCD counterparts throughout 2013. On the opposite side of the spectrum, smaller sets will also be included in Black Friday TV sales, but the price cuts won't be as substantial this year. For example, 32" 1080p LCDs will likely hit $179 again this year, which was the best price we saw during Black Friday 2012. These TVs haven't dropped that low since then and have averaged about $222 this year, so we don't think it's likely that they'll be any cheaper than $179 this time around. Furthermore, the past few years have shown that September, and not Black Friday, is typically the best time of year to find deals on 32" TVs. Likewise, 42" 1080p LCD TV prices have hit rock bottom, in that retailers just can't discount these items any further to create new all-time low prices. That said, deals will likely still attract bargain shoppers. We're predicting that 42" TVs will drop to $180 this year, just a buck above their smaller 32" counterparts. As a result, we're recommending that consumers opt for larger 42" TVs rather than smaller 32" sets. On the other hand, mid-sized 46" to 47" 1080p LCD HDTVs will see substantial price cuts: We predict these TVs will drop down to $269. Prices this year fell to as low as $298 in September, so $269 is not that far off. In fact, we think 46" TVs may even become the new doorbusters as retailers have already exhausted 42" TV deals. Although Black Friday is typically reserved for bargain bin HDTVs (premium sets see better deals beginning in December), retailers may try to lure shoppers into spending more money on a high-end TV. New 4K TVs and curved OLED TVs have hit the market with prices that are two to three times higher than those of traditional TVs. While these sets use the latest flat-panel technologies (and look great in showrooms), many new, high-end TVs have drawbacks. As far as pricing is concerned, 4K TVs have seen significant discounts this year already. Sony currently offers the cheapest name-brand 55" 4K HDTV for $3,400, while Seiki offers the cheapest big-screen 4K TV period with the 50" SE50UY04 dropping to $899 this summer. However, keep in mind that all of these TVs are first-generation sets with plenty of kinks to iron out. Some, for instance, may not support the just-released HDMI 2.0 spec, which among other things allows for 3840x2160 resolution video at up to 60fps, a big plus for gamers who require fast refresh rates. We say bypass the buzzwords and stick with the tried and true HDTVs of 2012 and early 2013 before maxing out your credit card on a next-gen display. Not sure what kind of TV to look for during the Black Friday season? Make sure you consult our TV buying guide before you dive into the deals. Do you still think the 60 inch plasmas will go for around your predicted price? Where can I find the 47' tv for $180.00???? I am in the market for a 55inch 3d led smart (brand name) tv. Would waiting till black friday be worth it? @The-Black-Friday-Pro Keep in mind that we're referring to 1080p 32" TVs. Those doorbusters from Kmart and Sears were 720p. I know Kmart and Sears both had 32" TV's for $97 as door busters. I bet we see a door buster for a 32" for $85 to $95 this year. @Paulyboy69 If you don't need a "smart" TV, then yes, we would generally recommend waiting until Black Friday. However, make sure you set up an email alert because the best deals won't last long and you'll want to jump as soon as we find it! So if I am currently in the market for a 32 inch – 42 inch LED HDTV (one that isn't a smart one) would not waiting until the second half of November (Black Friday time) be a bad idea at this point? I've seen what appears to be a handful of pretty nice deals pop up on your website in the last few weeks but haven't pulled the trigger more or less because of this article. I want a TV that I can mount on the wall right next to my computer to use both as a television and a second monitor at times. Getting one now would be great but I can wait if it means a reasonable amount of savings. Thanks and keep up the great work! How about some predictions for high-end prices? Too soon? Linking to the May entry "4K TV Deals May Be Awesome, But You'd Be Stupid to Buy One" is stupid. Why is Dealnews/Dealmac ignoring new 4K technology? Why is there no option to filter results of 4K TVs/displays? Why don't you have an article on the recent advances in 4K technology instead of throwing it in a lake tied to an anchor?